Natural looking clip-in Remy hair extension has the double weft of hair for adding bigger volume. The full head hair extension is comprised of 8 pieces, which you can easily fix between your natural hairs. The medium brown hair with dark blonde highlights suits light to medium brown hairs. It is available here in 16 inches length. 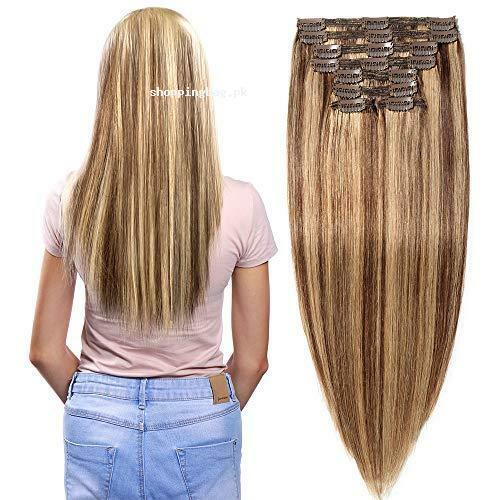 You can buy the reusable Remy clip-in hair extensions at reasonable price via Amazon hair extensions shopping in Pakistan. Brand s-noilite, grade 7A quality, 100% real remy human hair. Please choose our shop (US Fashion Outlet), be aware of fake products from other seller! Softly touch and glossy, tangle free, shedding free, can be washed & dyed, curled & straightened (temperature better below 356℉/180℃ for a short time). Color may vary slightly different due to the lighting effect, to ensure color match, you can send us a picture of your hair in natural light and our professional team will choose the most suitable color for you. Double Weft(two wefts sewed together)-thick than the other type hair, big volume for 110-170g, 8 pieces of different widths, normally one set is enough to make a full head.